(MP154). Alma Claude Burlton Cull (1880-1931). 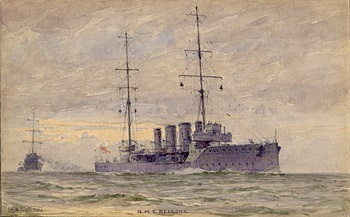 Watercolour signed and dated (LL) 1911 and annotated (LC) HMS BELLONA. Standard size: 5.5 x 3.3 ins (14 x 8.5cms) approx. This is classic Cull: starboard bow view (he did some of the port side but many more to starboard it seems! ); delicate greenish sea (just exactly as it so often around the UK); and intricate clouds. BELLONA, accompanied by another light cruiser, (perhaps one of the other two ships of the Boadicea Class, BLOND or BOADICEA herself) was the 7th ship in the Royal Navy to bear the name and was built in Pembroke Dock, Wales entering service in 1909. Classified as light cruisers they were smaller than today’s frigates and destroyers and at 385 ft overall length and displacing some 3,300 tons they mounted 6 x 4 inch guns and 2 x 18 inch torpedo tubes. Fitted with steam turbines they were capable of 25 knots sustained sea speed. After a hectic and very busy career - especially during 4 long years of the Great War - BELLONA was paid off in 1921 for disposal.